I was thinking about the possibility of serving lamb for Easter this year and grilling it on the barbecue. 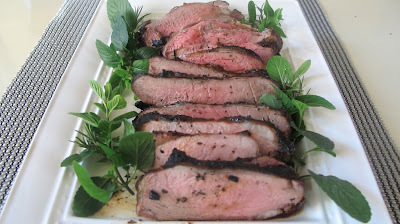 There are so many different marinades that would compliment lamb and I look forward to trying them in the future. Lay out lamb on a flat surface and trim some of the excess fat. Cut slits in the remaining fat and stuff with garlic and rosemary. Place lamb out flat in a glass baking dish. Combine olive oil, vinegar, mustard and Worcestershire sauce and pour over lamb. Marinade about 6 hours. Season lamb with Alfie's seasoning or liberally with kosher salt and pepper. Place fat side down and cook about 15 minutes turn and grill another 15 minutes or until thermometer reads 145F. Remove to a carving board and let meat rest about 20 minutes. Slice and serve with mint sauce. This salad on a bed of butter lettuce would be a great lunch or the start to a meatless Monday dinner. In a small ceramic bowl, mix all the ingredients together and set aside. 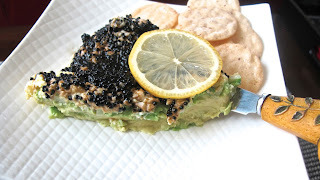 Combine olive oil and lime juice and brush over insides of avocado. Heat grill to medium and grill avocado for about 4 minutes, it will be warm and leave grill marks. 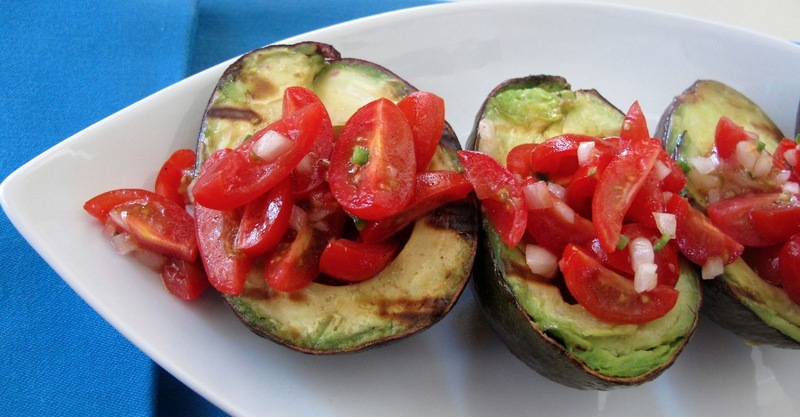 Put avocados on a platter and top with tomato salad. 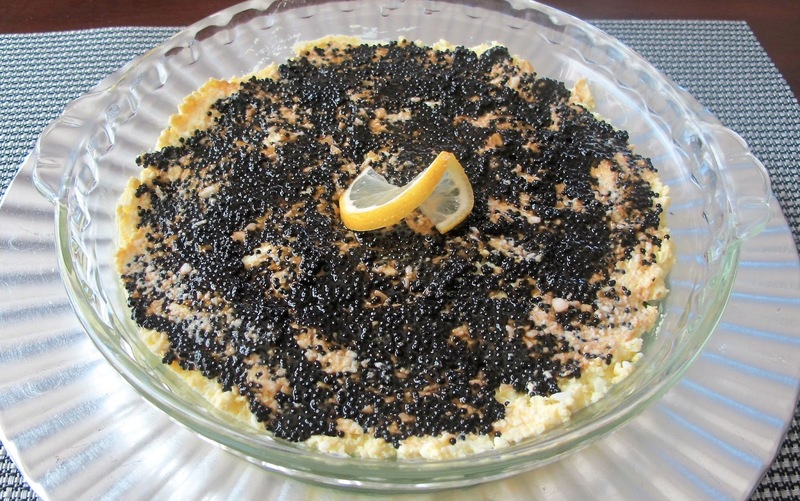 The Academy Awards are this weekend and if you are having a party, Caviar Pie would be fitting. 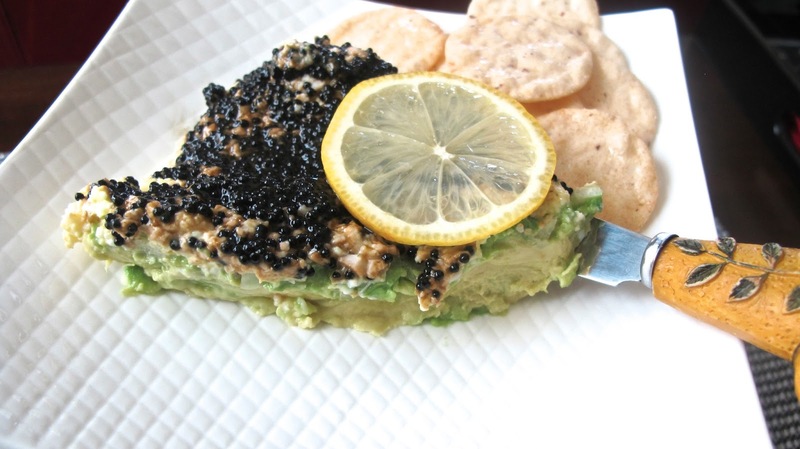 Made with black lumpfish (I prefer red) or if you choose, Beluga caviar. So, who will the Oscar go to? Lincoln? Argo? Les Miserable? Who is your favorite? In a 9 inch glass pie pan, mash avocados with a fork to cover the bottom of pan. Sprinkle onions over top of avocado. In a food processor, add eggs and mayonnaise and process until combined. Layer egg mixture over avocado and onion and spread evenly. Just before serving, carefully spoon caviar over top. This perfect winter side dish comes together quickly for any main course dinner, such as lamb. Line a baking sheet with foil and toss the tomatoes with olive oil and salt and pepper. Remove from oven and toss with fresh basil. 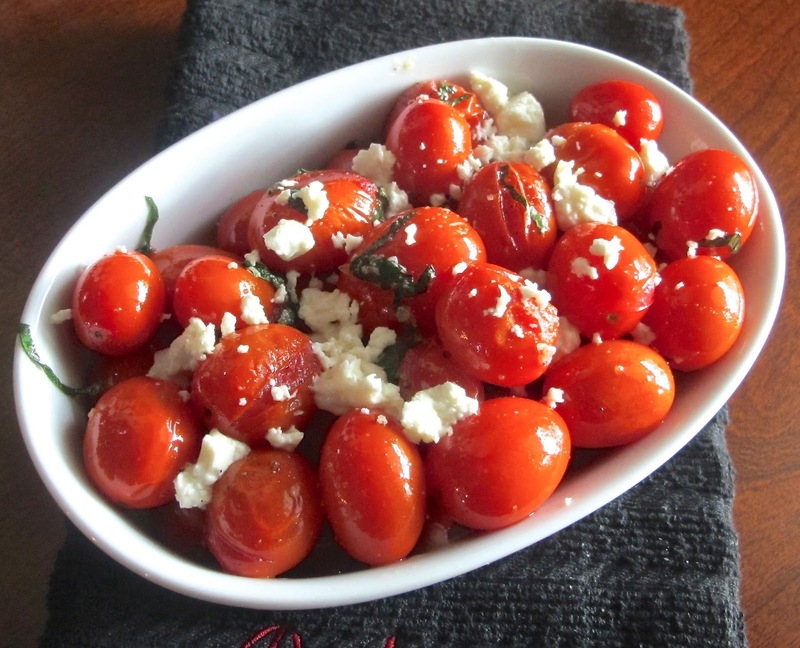 Put tomatoes in a serving dish and top with feta cheese. In a medium saucepan, heat olive oil and add sweet onion, garlic, peppers and thyme, cook until vegetables are softened, not browned. Take out thyme sprigs and discard. Add balsamic vinegar and reduce by half. Stir in honey, check seasonings and add cream. Blend to desired consistency, I chose to keep mine a little chunky for a rustic sauce. 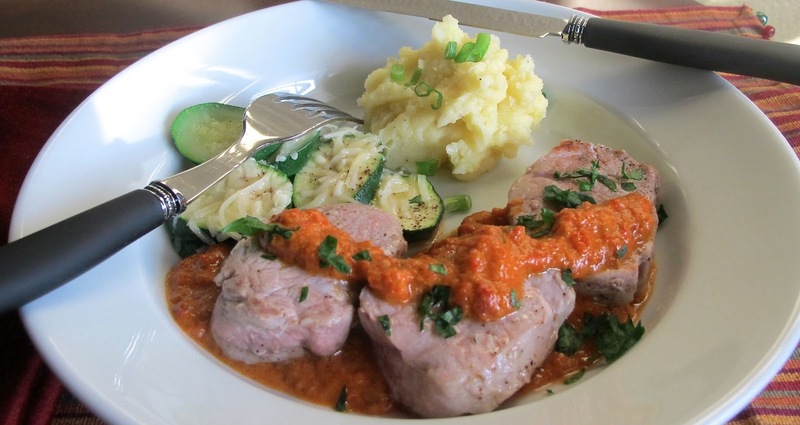 Season pork tenderloin slices with salt and pepper and cook in a saute pan over high heat, about 2 minutes on each side, or until inside temperature reaches 150F. Set aside. Put a layer of red pepper sauce on the plate, top with pork tenderloin and top with additional sauce. Sprinkle with parsley. You know that spring is going to come again, when you see the arrival of fresh asparagus in the market. To make quick use of them they were roasted and topped with a poached egg "sauce." Line a baking sheet with foil. Toss asparagus with olive oil and sprinkle with salt and pepper. Roast in oven for about 5-8 minutes, until tender. Take out of oven and squeeze lemon juice over asparagus. 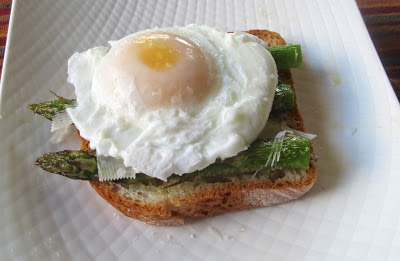 On top of toast, place asparagus and top with shaved cheese. Meanwhile, in a saucepan with simmering water add 1 teaspoon of vinegar. Place egg in water and poach to a soft egg. Place egg gently over asparagus and serve immediately. 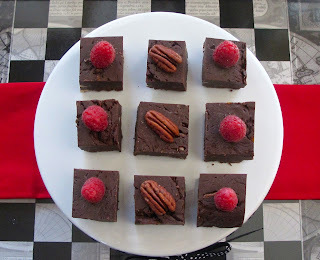 Chocolate... or chocolate fudge is suitable for any occasion! The nuts can be changed or deleted. A liqueur such as Grand Marnier or Kahlua could be substituted for the vanilla. 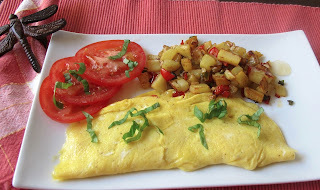 This recipe is simple to make but does require a couple of hours to set up in the refrigerator. Line a 8x8 inch pan with wax paper. In a medium saucepan over low heat, combine the chocolate, milk and salt. Stir until chocolate is melted. Add pecans, and vanilla and combine well. Pour into pan and chill in refrigerator for at least 2 hours. Take fudge out of pan by pulling on the wax paper and cut into squares. Another cold day, another soup to be made! Lydele gave me a smoked sea salt from Trader Joe's that I have really enjoyed and often use it in cooked dishes. 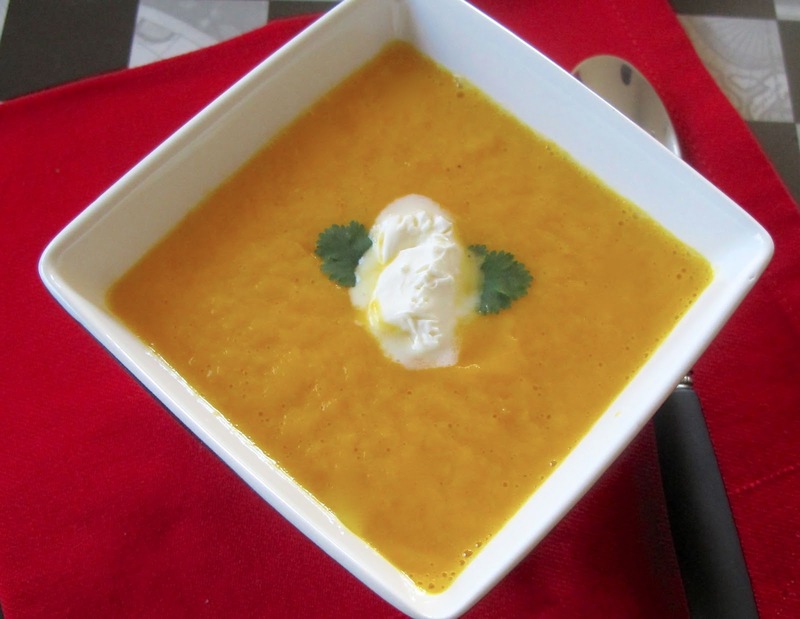 The cumin and roasted carrot give this soup a smoky flavor and the citrus a little brightness. Line a baking pan with foil. Toss carrots, onion, and shallots with olive oil and cumin. Roast about 35 minutes. In a medium size saucepan put roasted vegetables and garlic with the chicken stock and orange juice. Bring to a simmer and cook until vegetables are tender, time may be short if the carrots are already tender from roasting. Blend with immersion blender or transfer to blender. Add salt and pepper and blend again, check seasonings. Pour into bowl and garnish with creme fraiche and cilantro. I felt so bad for the couple over for dinner last night. They both had recent injuries and are each only able to use one arm. So with that in mind I made a risotto for a main course and a salad on endive spears. Dinner was enjoyable and easy for us all. The reason for this post is that I use endive a lot, for appetizers. They hold a smoked salmon mousse, a variety of fillings and soft cheeses but I had never thought of them for holding salads. Besides a Caesar salad, I got to thinking of stuffing the endive with a Waldorf salad for a ladies tea. Or what about baby shrimp or crab salad in endive for a summer day? Please share any ideas you think of. Here is a link to the recipe for Caesar salad dressing from a previous post. The Romaine lettuce needs to be torn or cut smaller than would be made generally for a salad. 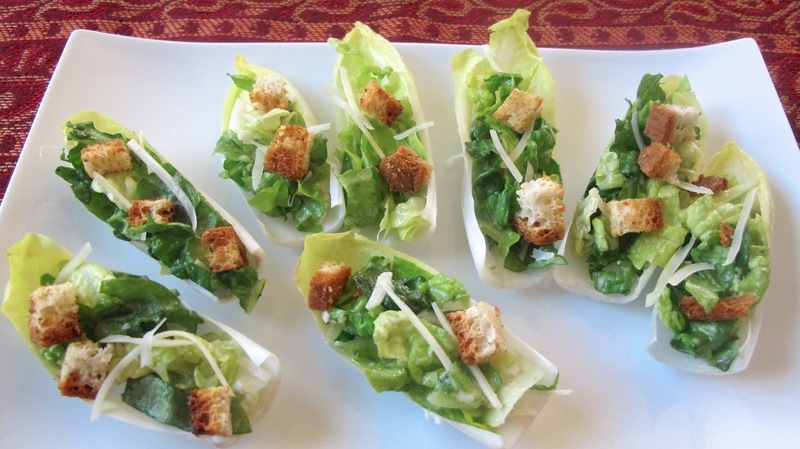 Put the torn Romaine into a salad bowl and top with Caesar dressing, toss and check seasonings. Stuff endive with salad and top with shredded Parmesan cheese and croutons. These lamb rib chops can be made a little ahead of time and will hold for a main course or an appetizer. They can be served with a variety of sauces, on top of mashed potatoes or with lemon rice. The sauce served here is inspired by a Tzatziki sauce. Mix all ingredients in a glass bowl and marinate several hours, turning to coat. 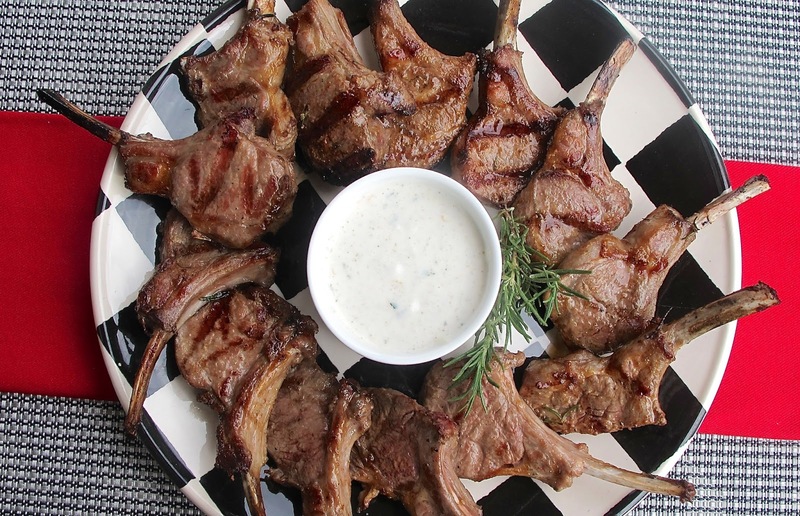 Bring lamb to room temperature and grill 2-3 minutes each side, depending on thickness. Whisk all ingredients together, cover and refrigerate for several hours until ready to serve. 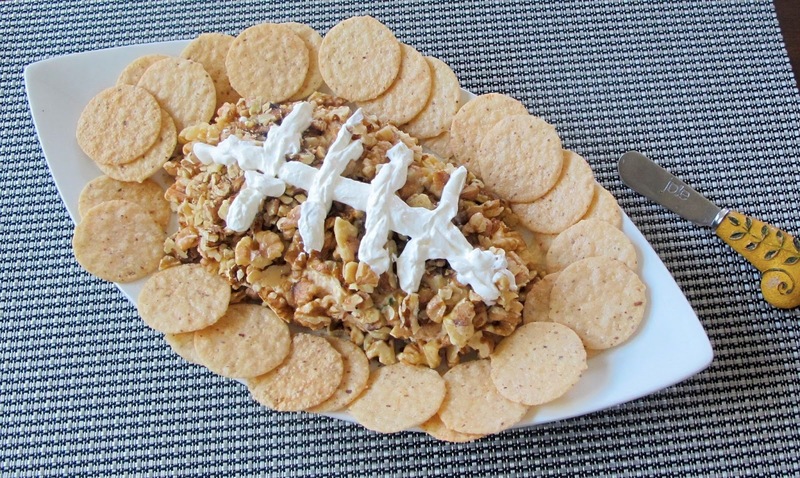 The big game is in just a couple of days, along with some wings and chili, try a little cheeseball shaped like a football. Mix cream cheese, cheddar cheese, mayo, Worcestershire sauce, Alfie's, Chipotle sauce, and garlic together well. Stir in bacon and green onion and allow to sit in fridge for several hours to meld flavors. 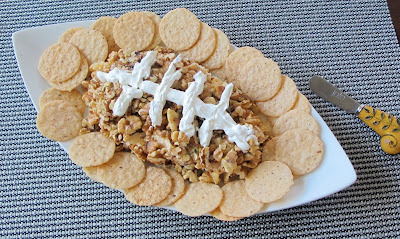 Form mixture into shape of football and top with toasted walnuts. Fill a piping bag or sandwich bag with some sour cream and snip the corner. Pipe the sour cream over top to make "laces." Serve with crackers, chips or baguettes.